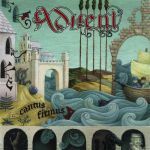 Advent's long-awaited second release finds the band once again pushing the limit of its members' collective talent. Boasting eight new dynamic and inventive original compositions—including what is arguably the group's crowning achievement to date, "Ramblin' Sailor"—the album features wonderfully elaborate arrangements, beautiful guitar work (including a substantial amount of classical and acoustic guitars), and tight vocal interplay. Also includes two previously unreleased 24-track recordings of songs from the band's debut CD as bonus tracks. Gozzozoo "Pictures of the New World"
Notify me of updates to Advent "Cantus Firmus"